At the HL7 booth, interoperability guru Micky Tripathi details the progress made on public APIs. Earlier this month, the HL7 Argonaut Project published its FHIR Data and Document Query Implementation Guide, which it bills as a "major step forward" for the agile interoperability standard. 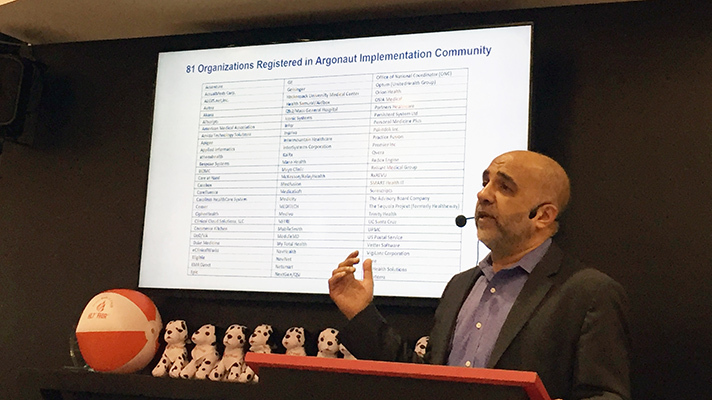 At HIMSS17 on Tuesday, Argonaut leader Micky Tripathi offered updates on the new guide, and put the project's accomplishments these past three years into perspective. The Argonaut Project, launched under the HL7 umbrella in 2014, comprises heavy hitters from both the vendor and provider sides: Accenture, athenahealth, Cerner, Epic, McKesson, Meditech, Surescripts, The Advisory Board Company, Beth Israel Deaconess, Intermountain, Mayo Clinic, Partners HealthCare and Boston Children's Hospital. "The idea was to get a group of implementers together, people who do this for a living, providers and vendors, to accelerate the use of FHIR and make it more practical and real for people," said Tripathi, CEO of the Massachusetts eHealth Collaborative. "It's completely private sector initiated and funded, not an ONC edict," he said. "The private sector needs to be stepping up more, to take over interoperability." The release of the new implementation guide is significant, said Tripathi. If interoperability standards are "ingredients," he explained, the new Argonaut guide for high-priority use cases is like a "cookbook," explaining how to put it all together. The Argonaut Project is so named because it was formed in the wake of the landmark JASON report, "A Robust Health Data Infrastructure," in which a government advisory panel of scientists was "highly critical of where we were in healthcare" with regard to interoperability, said Tripathi. Back then, Tripathi had some disagreements with the report's findings. "There's probably more progress in various types of health information exchange than the JASON authors seem to give credit for," he told Healthcare IT News in 2014. But it's also hard to argue with JASON's recommendation that healthcare data exchange make much better use of public APIs. Current interoperability is largely based around HL7's Consolidated Clinical Document Architecture standard, but that's a "complex vehicle for exchanging data, and somewhat unwieldy," said Tripathi. "It's got structured data embedded in it, but it's all wrapped up in a document. "If you just want a particular data element, like an allergy, you get a C-CDA," he added. "I might not want the whole C-CDA, but it's the only show in town. C-CDAs work for a particular kind of use case, but sometimes you just want data elements for quality measurement, or clinical decision support – or, increasingly, the kinds of lightweight apps people are developing." Indeed, beyond just being cumbersome, C-CDA is "too myopic, and "too healthcare-centric," he said, "creating barriers for innovators everywhere else in the economy who are doing all sorts of great things. Those developers have no interest in coming into healthcare if it's going to be based on C-CDAs." FHIR, on the on the other hand is flexible to both document level and data level exchange and is based on modern internet conventions. It’s a RESTful API that developers from outside healthcare can pick that up and say, “That, I understand." The Argonaut Project prioritizes speed-to-market, gathering the stakeholder input needed to make FHIR "relevant and usable," said Tripathi. "We need to have more of a way to get market input into the development process, get collaboration and consensus, as early as possible." Epic, Cerner, Meditech and others are already basing their APIs using Argonaut guidance. The new FHIR implementation guide hopes to spark even faster adoption of the standard in 2017 and beyond. This year, the Argonaut Project plans to broaden its focus to other use cases for FHIR and OAuth standards, said Tripathi, such as a scheduling API to enable better appointment functionality across EHRs (thus enabling easier referral management for ACOs tackling population health management), and work to enable better integration of external apps into EHRs.